The Santa & Co. LLC order season remains open while materials last. Order fulfillment is prioritized on a first come, first serve basis. Please order your custom apparel as early as possible for a better chance of receiving it in time for the Christmas season. You may refer to our Home and Order Forms page for the latest information regarding our order season and cutoff dates. Orders for available Halco products (view catalog) are open February through November. Please call us at (810) 329-3230 to get your Halco order started. How durable/lasting is your custom apparel? We guarantee 1 full year of material and workmanship on new Santa & Co. brand Santa Claus suits & apparel. Our custom apparel has been known to last many years with the proper professional Furrier Method cleaning, storage, and care. And while usage and care can vary from individual to individual, it’s safe to say the average Santa can expect their custom apparel to last for at least 5-10 years, when properly cared for. What are the benefits of wool over other materials? When compared to Santa Claus suits made with synthetics, like velvet, velveteen, plush-pile, or corduroy, our wool is longer wearing, more breathable, and more resistant to fading. Its resistance to fading—when compared to synthetic materials—also guarantees a consistent shade of red from coat to pants on our new suits, and provides a more reliable color match when, say, pairing a new suit separate with an older suit. Are these genuine “Charles W. Howard” Santa Claus Suits? Santa & Co. LLC’s Santa Claus Suit is the only Santa Claus suit to be officially endorsed by the Charles W. Howard family as the original “Charles W. Howard Santa Claus Suit” (Sole Intellectual Property of Santa & Co. LLC). How customizable are your Santa Claus Suits? Beyond the custom fittings on our suits, and our standard suit add-ons (see chart here), almost anything is customizable on ours suits for an additional cost. Suit coats and hat pom cords can be made at any length; suit styles can be mixed and matched; a variety of holiday patterns can be embroidered in gold on almost any of our custom apparel; and we can even provide extra faux fur for conversion into boot tops. Call us for details on all the customization options available. Why is there no price for your Classic Professional Suit? Our Classic Professional Santa Claus Suit and its Suit Separates feature customer’s choice of all genuine Icelandic Sheep, Rabbit, or Arctic Fox fur. The fur is special order, and is acquired per project. As such, market prices and availability can fluctuate greatly at any given time, making a static quote impossible. Please call us at +1 (810) 329-3230 for prices and availability. What is “Kool Mesh” lining? Available as an option for select professional grade Santa Claus suits models, our Kool Mesh lining replaces the standard satin lining in the suit’s coat (w/styled back vent) and pants, to improve airflow and decrease body heat for all warm climate, indoor, and long-duration mall wear. Our Kool Mesh lining is also available for select Santa Claus hats; either separately, or along with the suit coat and pants. Our Kool Mesh lining can be made in larger than our standard 2x size for special order, call us for details. See chart here for standard 2x prices. Is your Kool Mesh lining available without the coat vent? 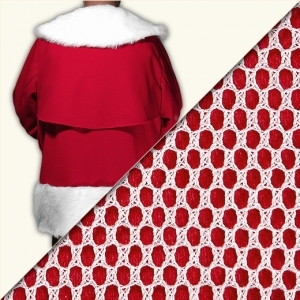 Yes, our Santa Claus suit coat’s Kool Mesh lining is available without the Kool Vent. Absence of the Kool Vent does not discount the Kool Mesh’s price. Where can I buy the boots featured on your Santa Claus models? When can I expect to receive my Halco order? The expected delivery time of in-stock Halco products is approximately 7-10 business days. Are sizing charts available for Halco products? Yes, a PDF sizing chart can be accessed via the “Halco Size Chart” button located to the right of each products’ description area. It can also be viewed here. Can I order a Halco product not featured in your catalog? As an Authorized Dealer of Halco merchandise, Santa & Co. LLC can deliver any item featured in the official Halco product line. If you need to order a Halco product not currently featured in our catalog, please call +1 (810) 329-3230 for prices and availability. Visa, MasterCard, checks, cashier’s checks, money orders, and cash are all fully accepted methods of payment. We do not accept PayPal payments at this time. For orders within the Continental US, we will accept modest payment plans (half down, etc.) if and when necessary. For international orders, full payment is required (sans shipping, handling, and insurance charges, due upon completion). Call us at +1 (810) 329-3230 for more details. We ship via USPS, UPS, and FedEx. International customers are required to pay the full order amount upfront (sans shipping, handling, and insurance charges, which are due only on order completion), and are responsible for all duties and taxes (import fees) incurred by their country of origin. Do you recommend shipping insurance? Yes, we recommend shipping insurance on any Santa & Co. order over $100. As stated in the terms at the bottom of each of our fitting forms, “ALL MEASUREMENTS PROVIDED BY THE CUSTOMER MUST BE ACCURATE AND UP-TO-DATE, AND IN ALL INSTANCES OF INACCURATE AND/OR OUTDATED MEASUREMENTS SUBMITTED BY THE CUSTOMER, SANTA & CO. LLC IS IN NO WAY LIABLE, AND WILL NOT BE RESPONSIBLE FOR ANY CUSTOM APPAREL THAT DOES NOT FIT.” As such, it is vital that when customers submit their measurements they be correct and accurate. We also ask customers to project for any variances in their targeted weight during the production of their custom fitted apparel, as to prevent any inconsistencies in the final measurements. After the customer purchases, receives, and samples the fitting of their custom apparel, they may find that further alterations or corrections are needed, and it is vital that Santa & Co. LLC be informed immediately, either by email (info@santacollc.com) or by phone (810-329-3230), so that we may begin the process to investigate and correct your custom fitted apparel. As per Santa & Co. LLC’s “Custom Fitting Guarantee,” for any fitting corrections needed directly after the customer receives their custom apparel: if the fitting errors are determined to be the fault of the customer, either by their original measurements or weight fluctuation since submission of their measurements, the customer must cover the shipping costs to Santa & Co. LLC, while Santa & Co. LLC will cover the shipping costs back to the customer. If the fitting errors are determined to be the fault of Santa & Co. LLC, based off of the customer’s original measurements, Santa & Co. LLC will cover the back & forth shipping cost and alterations the first time around. In all instances of alteration and corrections, we require the customer to re-supply their complete measurements, and provide photos of themselves wearing the custom fitted apparel, with the problem areas made clear. If any further alterations are needed, or in the case the customer gave incorrect measurements at the time of fitting form submittal, or at any time during follow-up alterations, Santa & Co. LLC is in no way liable for an incorrect fit, and the customer is responsible for all additional alteration costs, shipping and insurance charges. Does Santa & Co. provide cleaning and repair services? Santa & Co. LLC is the only full-service company in North America, and perhaps the world, that offers cleaning, repairs, and storage on our apparel and most other brand Santa Claus suits. Call (810) 329-3230 to get your apparel serviced now. The customer is responsible for all shipping and insurance charges. Visit our Services page for full pricing details. Can Santa & Co. apparel be dry cleaned? However, the chemicals used in conventional dry cleaning are harsher on our apparel when directly compared to our own Furrier Method cleaning process, and may cause colors to run.